Where educational guides are concerned the market is swamped with books claiming to be helpful and suitable for experienced and new teachers as well as middle managers and senior leaders. When you then take a closer look they cannot keep these promises. Here is a book that really works for all levels and keeps this promise. “Ticked off” takes its approach from Gawande’s “Checklist manifesto”, which demonstrates how checklists help to improve standards and avoid errors. Following the examples from the fields of sciences and medicine Harry Fletcher-Wood shows how aspects of teaching and organisation can be managed more easily by using checklists. 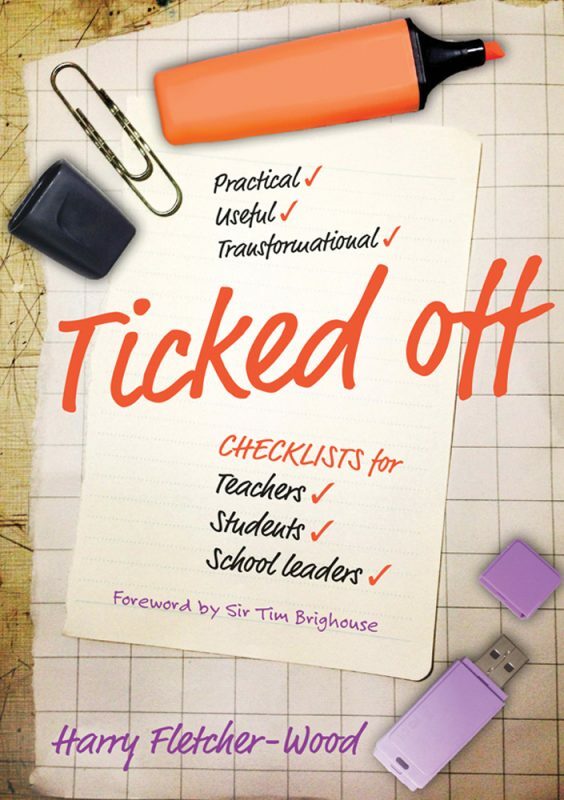 The book is divided into several chapters to cover checklists on all levels for teachers’ work and organisation in and around the classroom, to help middle managers and senior teams with their tasks of leading others, but also to help students with their learning by introducing writing frames and guidance for peer assessment in the form of checklists. The book’s structure makes it easy to read from the beginning to the end, to dip in and out of sections or to look up specific examples. Each checklist is presented as an example with some food for thought and ideas of how these can be adapted to suit individual purposes. In line with recent research-based activities and continuous professional development strategies checklists also help practitioners within education become more research literate and reflect strategically on their work. Teacher trainers will find this book an invaluable resource for the trainees in their charge. Whilst focussing on so many aspects of teaching trainees may forget the obvious and experienced staff would probably not remind them of routines they carry out automatically and possibly even subconsciously. In addition to helping with aspects of work and time-management Harry Fletcher-Wood does not forget teachers’ wellbeing and introduces checklists to ensure better work-life balance. Some checklists are quite personalised. “How will I get the students into the room?” for example suggests that a teacher stands by the door to oversee what happens outside and inside the classroom. This may work very well for some. Personally, I never stand by the door, but either inside or outside the classroom and so send the message that I trust my pupils, which helps foster a great relationship. A wider range of different approaches or more critical views could have been presented to engage new teachers specifically in more in-depth reflections, but the final pages in the book demonstrate how teachers can create their own checklists and thereby appreciate the deeper thoughts going into what they do. Irrespective of the ultimate complexity of the task on hand a checklist simplifies the task by breaking it down into manageable entities. But the real beauty of this book is that the checklists are easy to use and can be adapted for all aspects of teaching and working within education, from nursery and primary school levels through to higher education. All educational practitioners will find practical resources to improve their own practice, to lead and train others, to introduce and implement sustainable changes, to deal with difficult conversations, to lead meetings effectively, to gauge student voice and feedback and more generally to involve students by making them responsible for their own learning. It is a great book offering an interesting and practical approach to time-management. Having read this book I am now implementing checklists in my own work. If you only have time to read one educational book this year, make sure it is this one because this is a fantastic resource for all of us working in education.